Ustaz i am in support of what you have done and whatever needs to be done should be done in the name our creator and according to the teachings of islam as stated in the Holy Qur'an. Islam is a religion of peace and scientific in all its doings as such we should try at all times project the religion of Allah as a religion of peace. 1. Both Muslim scholars and leaders have failed to act decisively on the matter. Till date, the world is not compelled to recognize the gross misdeeds of Christians in Jos and in southern Kaduna against muslims as unjustifiable aberration that must be condemned and punished. Ironically too, Muslims scholars and leaders in Nigeria are still sharing blame on what had happened! 2. Jonathan has only proved to be a christian leader for the Christians alone. He does not even recognize the complicity and stupidity of Muslim elites, including some misguided ulamas who worked against more competent Muslim contestants during the April 2011 elections to make him president. He believes that the phantom votes that were said to have been cast in his favor in the Muslim north were by the igbos, not any Muslim. And no body has challenged him to date! Ustaz, the basis of stability and peaceful coexistence among Nigerians has been undermined right from the time Jonathan was instaled as president without true election. The fact remains that majority of Nigerians will never wish him well while he will never show compassion to them. This will be our lot until he is no longer in charge of our affairs! Great piece, as usual, sheikh. From our first meeting and following your work since, I have not stopped being pleasantly amazed by your nice combination of deep commitment and sincerity to your faith on one hand, and an invigorating openness to the other's faith, on the other hand. "All human beings, Muslims and Christians, are honoured by Allah as His vicegerents on earth...." How exponentially relations between Christians and Muslims in Nigeria (or every place in the whole world for that matter) would improve if all people of faith (or non-faith) were to affirm and embrace our common humanity and intrinsic worthiness of every human person as God's image bearers! Which brings me to another point about your visits. Of course, I am first to grant that Nigeria (I still have to believe) is a free country, and persons or groups can visit whomever they chose to. However, I would humbly opine there are reasons why "members of the League of Imams and [especially] the Nigerian Supreme Council for Islamic Affairs" should visit and commiserate with the Christian Association of Nigeria (CAN); which is personified in Pastor Ayo Oritsejafor in his official capacity as chairman of CAN. There is a variety of reasons why many of us might want things to be different, but the fact of the matter is that Archbishop John Onaiyekan is no longer the CAN chairman and no longer represent the Christian community in Nigeria in any official capacity--especially in relation to official governmental or inter-faith matters. It should not be the role of Muslim groups or other groups to pick and chose leaders for Nigerian Christians, and vice versa. We can only acknowledge and respect the leaders groups have chosen for themselves. 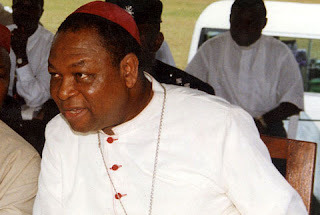 (I hope I am repeating something I would expect that Bishop Onaiyekan had himself communicated). There is an Igbo saying that when one is preparing a portion of eye-salve one should not add pepper to the concoction. Without question a huge burden for those who would stand in the gap and bridge the divide between parties is being walked upon by all people--including (especially) people they may not like personally. Jisike. God's speed!